So, you like to play but you don't want to pay alot? In the beginning you only had two choices to pick from. 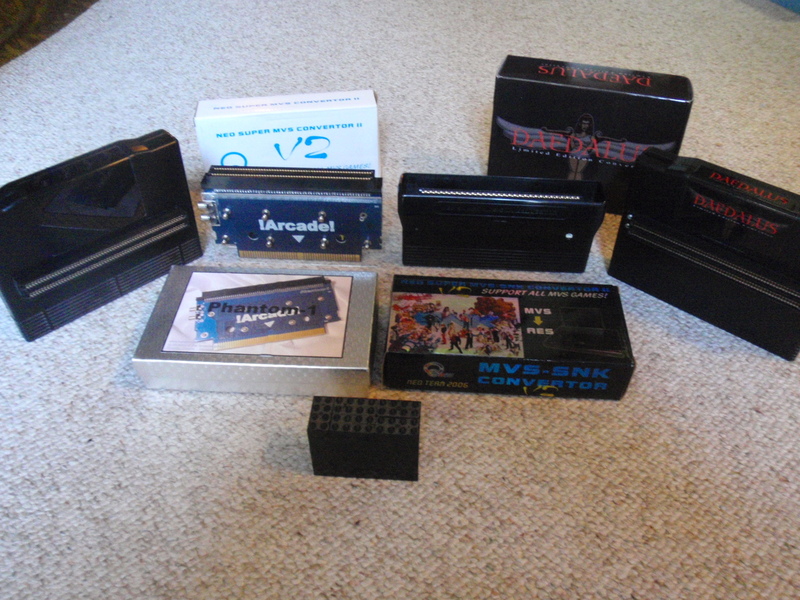 The first choice was to purchase a NEO-GEO Home Cartridge System and then purchase HOME cartridges for the system. In recent years, many of the most popular and/or most wanted cartridges have become extremely difficult to find as well as prohibitively expensive. In addition, 35% of the NEO-GEO cartridge library (that is 31 of the 148 game releases) were never released on home cartridge format. So this option also does not allow you to play every single game. The second choice was to purchase an MVS arcade jamma board and either play it with a Supergun or "consolize" the board for use on a regular home television set. Either method would indeed cost you some time or money. And although you would gain the ability to enjoy 100% of the game library, you would lose the "feel" of having a nice simple and elegant home system console. With this choice however, game cartridges are much easier to locate and far more affordable. So, back in the late nineties, a third option presented itself. The MVS adaptor or converter as it is commonly referred to finally surfaced! It took a few years, but after a few improvements they finally got this thing perfect. A device that costs about the same as ONE home cartridge, which then allows your home console to play ANY and EVERY MVS cartridge. Yes, think of it as an expansion module which increases the compatibility of your HOME system by 35%! The MVS adapter is indeed great for everyone with a home console. If you are a COLLECTOR, this device COMPLIMENTS your NEO*GEO home cart collection by expanding its library by 35%. If you are a gamer, you will find the adapter ideal for your cheap gaming needs. Hunting down and purchasing MVS cartridges is easier, faster, and cheaper then it is for home cartridges. Furthermore, just ONE $50 MVS cartridge game purchase makes up for the $300 cost of the converter! Games like Pulstar, Metal Slug, Ninja Masters, Kizuna Encounter, Ultimate Eleven, & Quiz Chibimarukochan for example would cost you hundreds if not thousands on home cartridge. Christmas 2011 When I wrote the above article in 2006, little did I know that after thorough testing, the super mvs adapter would also later be found to have its' own compatibility issues as well as all of the others. But now, thanks to the amzing tireless efforts of David Garrett, another, possibly perfect, MVS adapter has been designed and manufactured for the NEO-GEO community of gamers & collectors. I am writing this in a mad rush at the moment, but because it just arrived, way sooner then I even expected, I felt compelled to at least document it here for everyone else to see. Here is my family picture of the progression of the MVS adapter. Interesting how the original design, which was always my preferred design, pretty much came full circle. The LEGO brick you see at the the front of this picture, was what I would use to keep the horizontal MVS cartridge secured when inserted into the original adapter. It may not even be needed anymore. Anyhow, I will be doing some THOROUGH testing with the entire 148 cartridge library, as well as a dozen or so "other" unique cartridges (left to the reader's imagination of course) during the course of this weekend, and I will report back with my results! I am very much looking forward to it! The MVS Adapter Family Tree together for Christmas 2011 YES!